I love Fall. For me it feels like a fresh start. I don’t mind Spring and Winter, mostly hate Summer, but love Fall. I want to be outside, to better myself, clean out closets, start a jogging program – all of it. I think all type-A people get this sort of brain-itchy feelings about some things. For me, it is seasonal decorating. I am not good at it. My mom – now there is someone who is good at seasonal decorating. She has a house that is decorated in colors for all seasons, and with a few thoughtful flourishes, all seasons are welcomed. My house has a base of a princess nursery decorated for easter. Spring and summer make sense in my house. All other seasons feel not quite right. 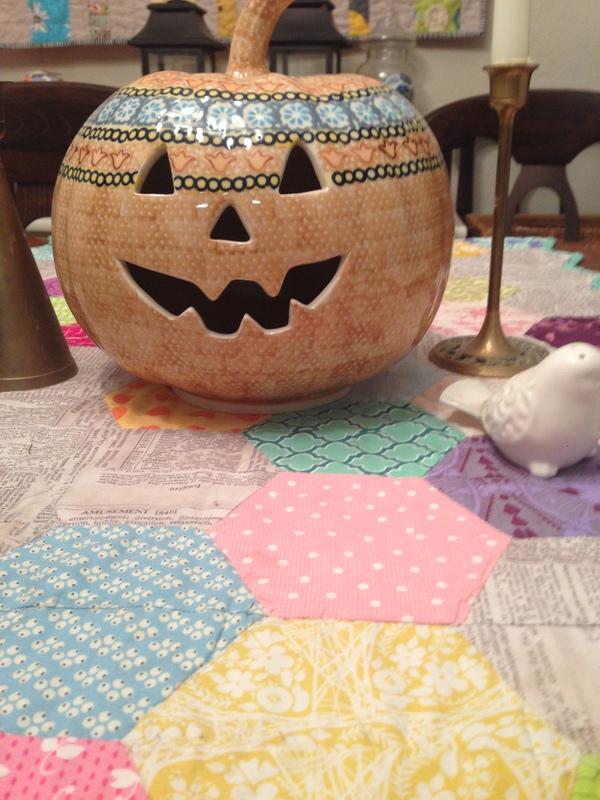 This year, I have added some quilts to my dining room (here and here), and while they make sense for spring and are ok for summer, I had no idea how I was going to make the dining room work for the season of gourds and russet tones. And then DH and I saw this pumpkin on one of our trips to the polish pottery place in Weston, MO. Fall decorating SOLVED! It is fall-themed in spring colors. I put it on my dining room table and done and done and done. Previous postWIP Wednesday – Quilting to take the edge off!